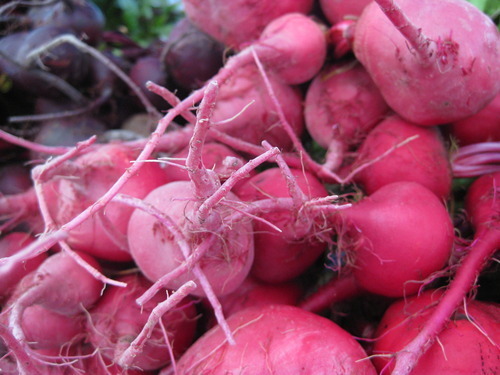 Beautiful beets are piled high at Seattle farmers markets this week. 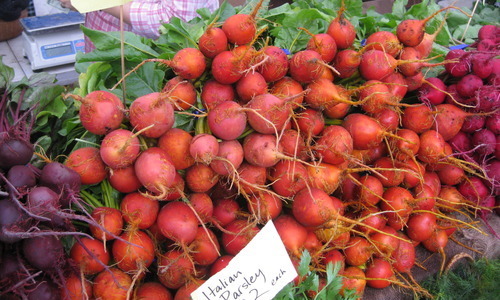 Here’s some nice bright ones from Local Roots Farm, at the Queen Anne Farmers Market! Did you know beets came in all those colors? Or did you think they were just those slimy red things that come in a can? That’s what I thought, for a long time. And then I figured they were just too darn hard to cook, and who knows what to do with them anyway, besides tuck them in the corner of a Greek salad behind the feta? 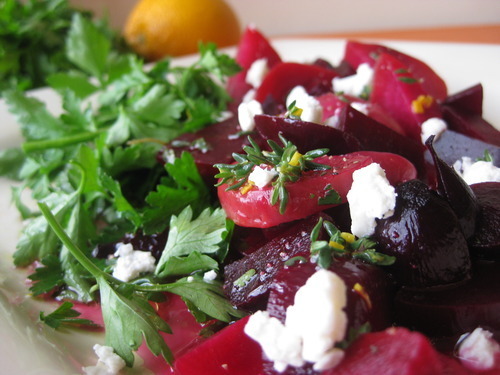 Of course there are tons of things you can do with beets, they are not hard to cook, and there’s lots of different kinds (that’s the point of this post, after all), so let’s get down to business and figure out how to use our different types of beets! I bought two types of beets from Stoney Plains Organic Farm at the Phinney Farmers Market this week. Chioggia and Cylindra beets. Aren’t they pretty? I asked the nice fellow at the Stoney Plains Organic Farm stall what’s what with these two types of beets, and he told me that the Cylindras are sweeter and the Chioggias are prettier. So, I took my bunches of beets home and sat down to do some research. According to The Kitchn and Worldwide Gourmet, Chioggia beets are an heirloom variety, sometimes called Candy Cane beets or Bullseye beets because they have a pretty striped red and white inside (which you’ll soon see!) 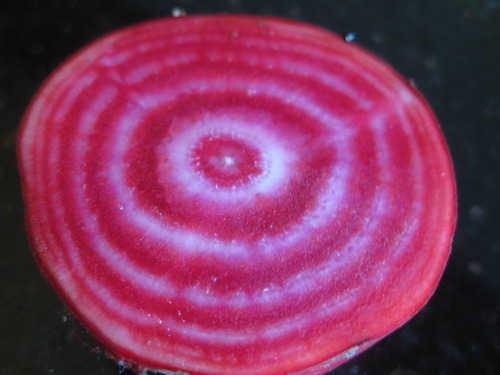 This beet comes from Chioggia, Italy, a coastal town near Venice, and has been around since the early 19th century. 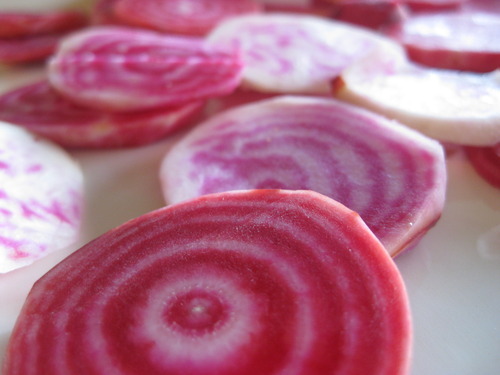 Chioggia beets can be used in all sorts of recipes, roasted, boiled, etc, but since the nice stripes fade when cooked, they look better raw. However, I don’t really like raw beets. So, I decided to make beet chips! Using Lemon Basil’s beet chip recipe! Less pretty, maybe. But still stripe-y! Pretty tasty, too. Could be crunchier, but I think they needed to be sliced a little thinner. So, I decided to roast this sweet beet for a salad. 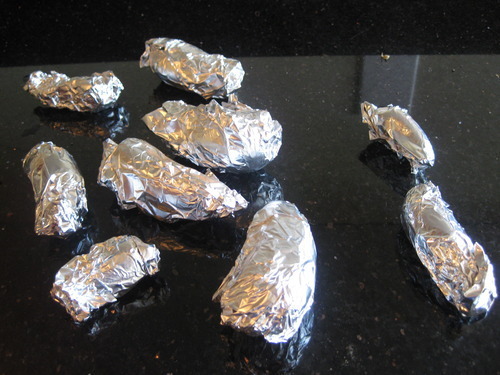 I wrapped these all up in tinfoil, like little beet spaceships, then popped them in the oven for 1 hour. When they came out, I let them cool, and then rubbed their skin off. It comes off really easily. And it turns your hands hot pink! Then I chopped them all up, and it was a good thing I roasted some Chioggia beets too, because I had a nice mix of pink beets and purple beets. I taste tested the Chioggias and the Cylindras side by side, and the Cylindras were a teensy bit sweeter …but not much. Both were pretty sweet. Which meant they tasted really good in this beet salad! Tossed with white vinegar/orange juice/orange zest/thyme dressing, topped with goat cheese, and served with Italian parsley -the sweetness really stood up to the acidity of the dressing and the woodiness of the thyme! So, there is a little difference between Chioggia and Cylindra beets, but not too much, taste-wise. 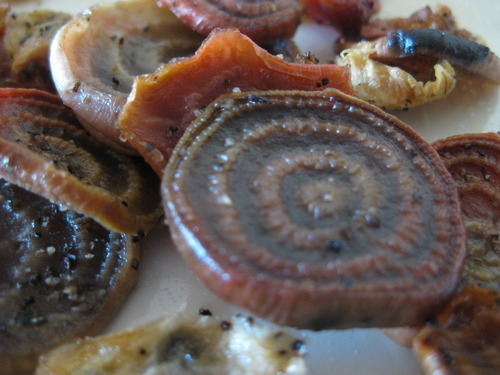 Both are sweet, both can be roasted, baked, sliced, and boiled. 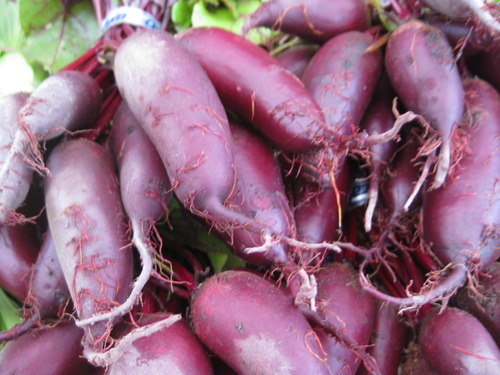 It’s more about the history of the heirloom beets and their appearance. Candy cane stripes or rich purples! Beet that! 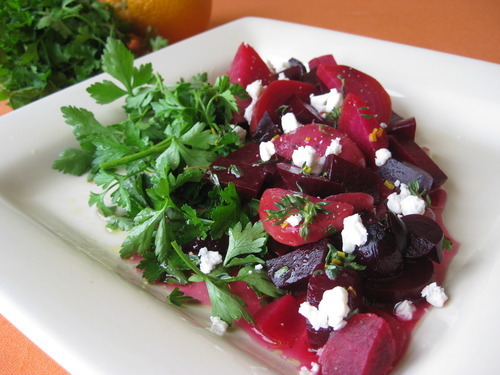 This entry was posted in In the Kitchen (recipes & more) and tagged beets, chioggia beets, cylindra beets, Lisa Wheeler, local food, Real Time Farms. Bookmark the permalink. For a special tasting beet, try pickling it. Grand ma packed a pickle jar full of whole small,beets. Larger beets were sliced, cut in half or into quarters. cover with boiling vinegar containing your pickling spices. When cool, store in the refrigerator, tightly sealed. Best served after setting for at least 2 days.